It is great to be back home after three weeks of traveling in America and Canada. I’ve missed doing my Woman Crush Wednesday cooking tutorials on Snapchat (username blissbakery) and sharing the love on here as well. Today is the 64th WCW recipient and this chef is an icon. One of the most influential people in the foodie world, in fact she even ignited an entire food revolution. 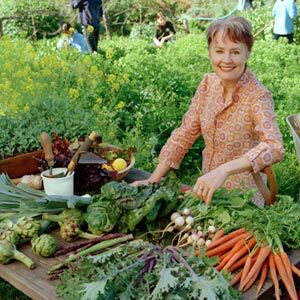 Alice Waters is the chef and creator of the famous Chez Panisse in Berkley, California. I had the pleasure of eating at her restaurant which is famous for its locally grown and organic ingredients. Alice Waters is called the “Mother of American Food” for a reason and has championed the Edible Schoolyard Project which is now in over 5,000 schools. Alice’s name is no stranger to this blog. I have mentioned her numerous times. Though this is the first time I am honoring her with her own special day on here, she is a chef that has inspired me for decades . My former teacher and mentor Darian Allen of Ballymaloe Cookery School is often called the Irish version of Alice Waters. In fact the first time I went to Ballymaloe House in 2002, I had a long conversation with Darina who spoke of her friend Alice with love and admiration. 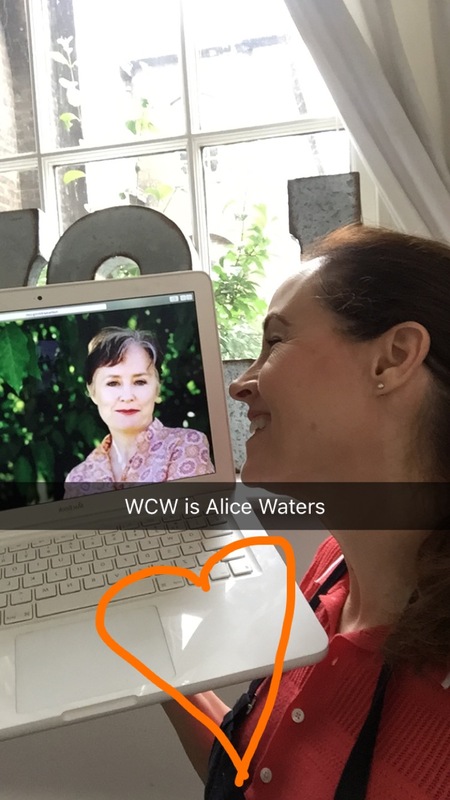 Many other WCW chefs such as April Bloomfield (who worked at Chez Panisse) and Skye Gyngell have all cited Alice as a notable influence on their work . Lucky for me I know first hand from tasting her food that Alice is a genius for bringing all of us back to the pure simplicity of great ingredients! One of the most recognizable food trends Alice is credited with influencing is the humble salad. Back in the day salad was thought of as iceberg lettuce smothered in blue cheese dressing. Alice’s salads were different. They were always unique, beautiful, satisfying and of course organic. 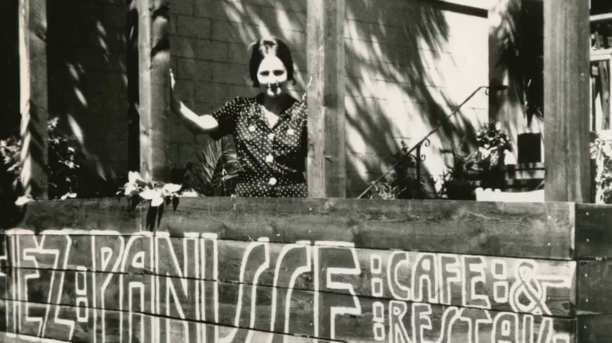 From the beginning of her restaurant she served mixed leaf lettuces in creative ways. These healthy works of art dispelled any naysayers who scoffed at “a plate of weeds”. 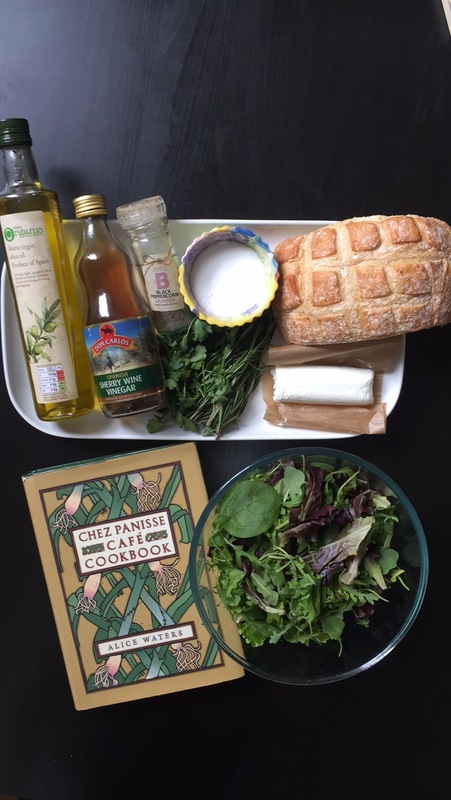 For Alice these flavorful greens reminded her of the time traveling in France. The French knew that including salads with the meal helped digest the food. Simple salad dressings delicately splashed on top with other delights such as the perfect avocado, sun ripened cherry tomatoes and an artisan cheese were ground breaking dishes to be served. 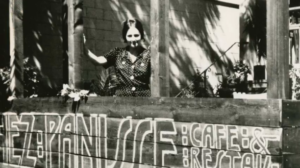 Now there are entire take out salad chains that literally owe their success to the woman who started it all in 1971. With that in mind, I thought choosing an Alice Water’s recipe for today’s tutorial had to be a salad. But not any salad. It is the salad that I tasted and fell in love with when I ate at Chez Panisse. Even with a changing menu each day, this is always on it. 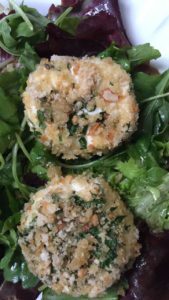 Not to sound too dramatic, but it is the one recipe that catapulted goat cheese to culinary cult status. 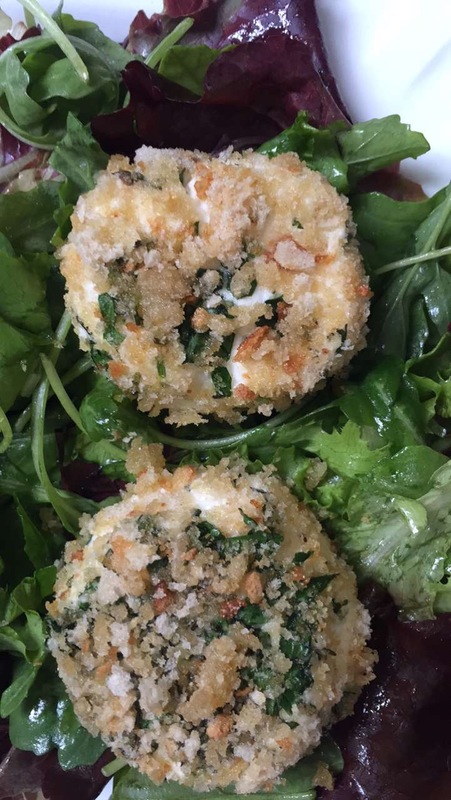 It is called Baked Goat Cheese with Garden Lettuces. While Chez Panisse is all about seasonality, this salad still works. For instance Alice adapts it for the autumn/ fall by using rocket (arugula) leaves if necessary. So let’s get cooking! Carefully slice the goat cheese into 8 disks about 1/2 inch thick. Pour the olive oil over the disks and sprinkle with the chopped herbs. Cover and store in a cool place for several hours or up to a week. Preheat the oven to 300F/160c. Cut the baguette half lengthwise and dry out in the oven for 20 minutes or so, until dry and lightly colored. Grate into fine bread crumbs on a box grater or in a food processor. The crumbs can be made in advance and stored until needed. Preheat the oven to 400F/200c. Remove the cheese disks from the marinate and roll them in the bread crumbs coating them thoroughly. Place the cheeses on a small baking sheet and bar for about 6 minutes, until the cheese is warm. Measure the vinegars into a bowl and add a big pinch of salt. Whisk the oil and a little freshly ground pepper. Taste for seasoning and adjust. Toss the lettuces lightly with the vinaigrette and arrange on salad plates. With the metal spatula, carefully place 2 disks of the baked cheese on each plate. Serves 4. As you know if you’ve already read the ABC of YDP, my photography skills leave much to be desired. But these pics, taken from my Snapchat tutorial today, will have to do. 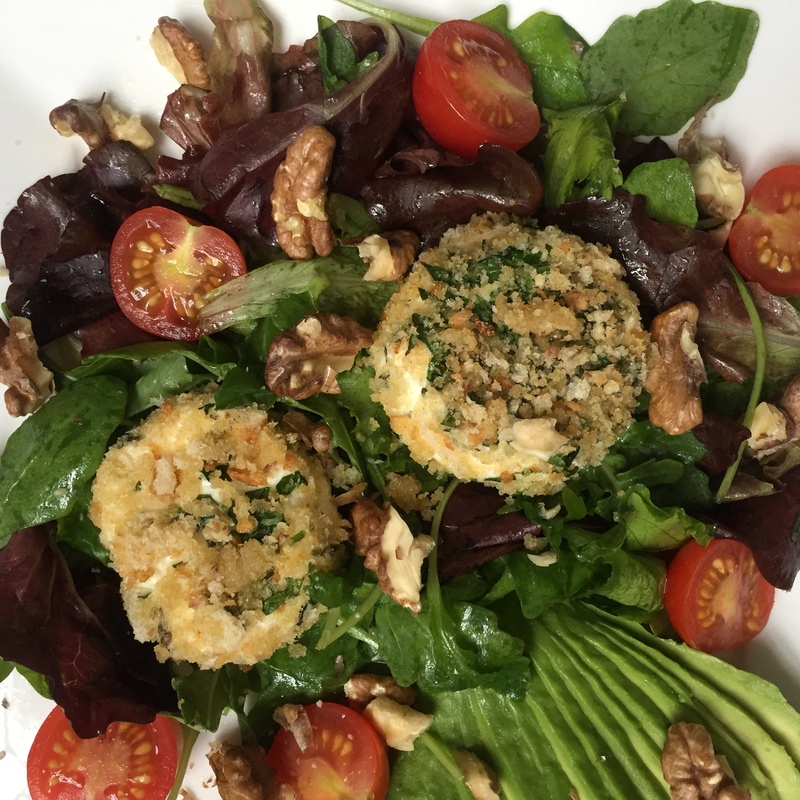 No matter what they look like, this baked goat cheese salad tasted utterly amazing. Just the right creamy, warm and tangy goat cheese bite with the bit of crunch from the crust. And the salad dressing is perfect! Loved the simplicity of it. Though it is important to have good quality ingredients as Alice would say. I read online that some folks have added mustard to the dressing but I liked it as is! If I added anything it might be a touch of honey, which makes a great emulsifier in salad dressing. As well, I like most things sweet! Looking through the rest of Alice Waters’ many cookbooks, her salads are very diverse. Since I am a salad nut, I appreciate how a salad can incorporate nearly every flavor or texture. So if it is eaten as the meal itself, not just as a starter, then you feel totally satisfied. Hence, I thought it might be nice to try this salad with a variation too. I sprinkled toasted walnuts, organic vine ripened cherry tomatoes and some avocado. I figured Alice wouldn’t mind my improv on her recipe. Reading a recent interview she did in Harvard Business Review she encourages her entire staff, not just the chefs, but all involved in the restaurant, to taste the food and give feedback/suggestions. She is a born nurturer and in every way shows love and compassion for people, food, nature. She’s one incredible human being. Not surprisingly, she has more accolades than you could imagine, including the James Beard Best Chef in America Award in 1992. The first female to win it! 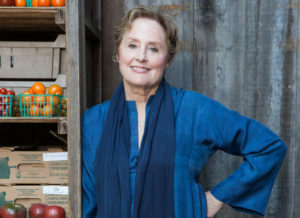 Yet at 73 Alice Waters not only retains the utmost humility in her success, but she doesn’t appear to be slowing down. She has her feet firmly planted. Which she obviously knows a thing or two about planting and gardening so it makes sense she is so grounded. If you can’t tell I just love this woman. And besides Darina Allen, I found another connection to Alice. In her early days, she knew and worked with Robert Scheer, one of my former U.S.C. professors! It really is a small world after all. And if we heed Alice’s advice, it will be a small GREEN world after all!